Yuudai is a young man in his 20’s. After a series of failed relationships, he is currently seeing Chizuru. However their relationship is at a tipping point. Yuudai finds it incredibly difficult to tell his significant other that he loves her. Apart from his clumsiness, his fear in telling someone that he loves them has ended pretty much all of his previous relationships. But Yuudai plans to end all of that. Two days before Christmas, he sets up a date in order to confess his love to Chizuru, bringing a present along, a pet rabbit. Before he can get to his confession, he is interrupted by a phone call. It’s the pet store explaining that they have accidently given him a mini donkey instead of a rabbit. Upon hearing that the creatures can be aggressive and bite, he rushes back into the café only to find the table overturned and both the donkey and Chizuru gone. He runs around the area in a panic looking for her, but can find no sign of her. He rings her mobile phone only to have another man answer. The man informs him he had found the phone on the ground. Yuudai tells him to wait there so he can retrieve the phone, however by the time he arrives at the agreed meeting place the man is gone. Thinking that Chizuru has probably gone home, he goes to her flat, only to overhear her criticising him to what seems like another man. Yuudai believes that Chizuru has dumped him for someone else. Going back home dejected, Yuudai discovers his ex-girlfriend, Miki, waiting outside. She explains that she has had a fight and has nowhere to stay. Despite him saying no, she ends up staying the night, though both don’t have any sexual interest in each other and nothing happens overnight. In the morning, Chizuru arrives with the mini donkey. Yuudai panics and asks Miki to hide out of sight; however she pokes her head around the corner. Shocked, Chizuru questions Yuudai as to who this woman is. Instead of rationally explaining the situation, Yuudai accuses Chizuru of seeing another man. An argument ensues and Chizuru tearfully leaves. To add insult to injury Miki bids him farewell after a phone call, saying she and her boyfriend have got back together. Yuudai is yet again left dejected and alone. It’s yet another failed relationship. However the mini donkey has other plans. Spotting something on Tokyo Tower, he takes off like a rocket with a confused Yuudai chasing after him. At Tokyo Tower something miraculously occurs which will turn Yuudai’s life around. This two part OVA was a co-production between Production I.G and the Japanese division of music label BMG (which was eventually folded into Sony Music Japan a few years later), to celebrate both companies 20th year anniversary. The anime seems to be based on a josei manga by Fumiko Tanikawa, who writes a lot of short works for young women. She seems relatively unknown in the west with none of her works being published in English. The single “Tokyo Marble Chocolate” manga tankobon was oddly published four months after the OVA was released. I suspect the manga and OVA were created together as one project, however I can’t find any evidence to confirm this. The manga was serialised (two chapters) in josei manga anthology Kiss. The title is an odd one. Certainly there isn't a single mention of chocolate in the show, but the Marble part seems to be derived from the café which Chizuru and Yuudai go to. This OVA is the debut directorial work for Naoyoshi Shiotani who would late go on to helm “Blood-C: The Last Dark” and more famously the two “Psycho-Pass” TV series as well as the theatrical feature. While both of those projects are quite dark and violent, the OVA clearly shows he’s more than capable of depicting the bright and colourful josei manga world that Chizuru and Yuudai inhabit. As this OVA was a co-production with record company BMG Japan, it should come as no surprise that two of the label’s artists feature pretty heavily. Rapper SEAMO appears as Chizuru’s boss and Takuya Ohashi and Shintaro Tokita of rock group Sukima Switch, have a cameo as the staff of the pet shop. Naturally both artists’ music appears during the end credits for each OVA. As for the OVA itself, interestingly the two parts depict the story first from Yuudai’s viewpoint, then through Chizuru’s eyes in the second part. In a romantic comedy like this, of course there’s going to be lots of miscommunication and misunderstandings. The second part of the series fills in a lot of the missing information from the first. It also shows that Chizuru is just as unsure of herself and lacking as much confidence in relationships as Yuudai. It also clearly explains why Chizuru forgave Yuudai so quickly. The first OVA makes Chizuru look incredibly forgiving considering how Yuudai treated her. The catalyst that makes this series work is the bizarre looking mini donkey. Apparently this was creation of Naoyoshi Shiotan and doesn’t appear in the manga. This weird almost patchwork looking creature pretty much brings the pair together and provides a lot of the humour in the OVA. Though a few reviewers despise its presence, I found the mini donkey adds a much needed lightened mood to the OVA which can get a bit dark and overly emotional at times. Of note is the use of two of Tokyo’s most visible landmarks; Tokyo Skytree, where Chizuru works in a café, and Tokyo Tower, close to Yuudai’s apartment. I suppose to a degree this symbolises the gulf between them and how different the pair are, but I’m not entirely sure it works. Strangely this OVA was released half a year before construction of Tokyo Skytree even began. As a result the sequences showing the interior don’t really resemble the finished building. There’s also the lack of believability of Chizuru being able to see Yuudai’s apartment in Minato from Skytree in Asakusa through a pair of coin operated binoculars on one of the viewing platforms. Apart from a couple of visual techniques which I thought were out of place, the other thing I really couldn’t reconcile with was the fact the free spirited, sexually confident Miki was previously Yuudai’s girlfriend. They just seem so horrendously mismatched and I just can’t imagine them actually meeting in real life. This is the first and only English language release of this OVA in the world. I’m sort of surprised it got any kind of release given that a decade has passed since it was first released in Japan (and fandom hasn't exactly been chomping at the bit for it to be released), let alone the deluxe treatment All the Anime has given it. The DVD and blu-ray come in a digipak with Tanikawa’s artwork of Chizuru and Yuudai. 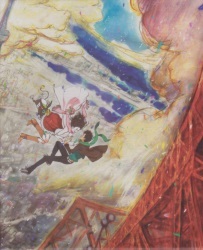 The digipak comes in small chipboard box with artwork depicting Chizuru’s fantasy sequence from the second OVA. The discs contain music videos for SEAMO and Sukima Switch (culled from footage from the anime) and All the Anime’s trailer as extras. The box also comes with a 40 page full colour booklet with character designs, and a lengthy profile and interview with Naoyoshi Shiotan. Interestingly this disc does not contain any French language options unlike many other All the Anime releases which do not contain English dubs. This means this project is a UK only release. Considering how niche it is, the fact it's sub only and won't sell that many copies and the effort gone into the packaging, that astounds me. Overall this is pretty good short OVA series. It’s colourful, well animated and quite fun. It does get a bit schmaltzy at times and some of it can feel a bit unrealistic (as long as you can suspend disbelief over the mini donkey). But in the end it’s just meant to be a bit of fun and not something really profound. It gets 7 out of 10 from me. Remaining Backlog: 10 TV series, 5 OVAs and 7 movies. In addition I am also waiting for additional parts of 6 TV series to be released before viewing them.